Our most popular chocolate covered snacks and fresh roasted nuts can be mixed and stacked to accommodate everyone’s tastes. If crispy, crunchy, salty and sweet is what they crave, this gift really satisfies. Choose one, two or three containers filled with the item of your choice. All containers have the option of a custom label. * Choose 2 containers to be stacked and wrapped with a bow. 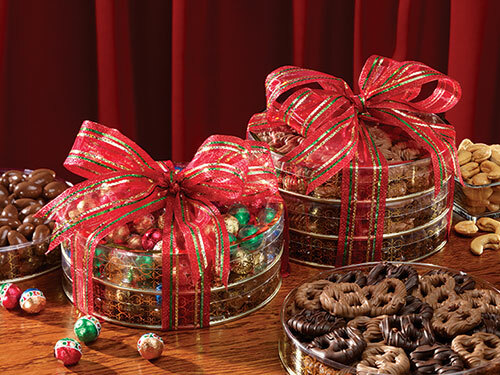 * Choose 3 containers to be stacked and wrapped with a bow. Our Crystal Collection includes a custom label option which allows you to choose 1 of 5 designs and include your company name and/or logo or a standard label with your greeting and company name only. Custom label orders require a minimum order of 10. Check here to view your choices. Once your order is placed, within your email receipt you will receive a website link to upload your logo. © Copyright 2019 by Gardners Candies Inc. All Rights Reserved.